"Interestingly, Milne didn't write the Pooh stories and poems for children but instead intended them for the child within us." "Just what I feel," said Rabbit. "What do you say, Pooh?" Pooh opened his eyes with a jerk and said, "Extremely." "Extremely what?" asked Rabbit. "What you were saying," said Pooh. "Undoubtably." Piglet gave Pooh a stiffening sort of nudge, and Pooh, who felt more and more that he was somewhere else, got up slowly and began to look for himself. "But how shall we do it?" asked Piglet. "What sort of a lesson, Rabbit?" "That's the point," said Rabbit. The word "lesson" came back to Pooh as one he had heard before somewhere. "There's a thing called Twy-stymes," he said. "Christopher Robin tried to teach it to me once, but it didn't." "What didn't?" said Rabbit. "Didn't what?" said Piglet. Pooh shook his head. "I don't know," he said. "It just didn't." "Well," said Owl, "the customary procedure in such cases is as follows." "What does Crustimoney Proseedcake mean?" said Pooh. "For I am a Bear of Very Little Brain, and long words Bother me." "It means the Thing to Do." "As long as it means that, I don't mind," said Pooh humbly. "The thing to do is as follows. First, Issue a Reward. 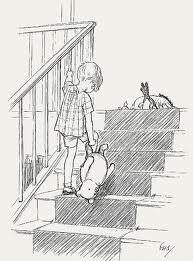 Then---" "Just a moment," said Pooh, holding up his paw. What do we do to this--what you were saying? You sneezed just as you were going to tell me." "I didn't sneeze." "Yes you did Owl." "Excuse me, Pooh, I didn't. You can't sneeze without knowing it." "Well, you can't know it without something having been sneezed." "What I said was, `First Issue a Reward.' " "You're doing it again," said Pooh sadly." Might yet be named "The Handsome Cub"! Even though the disney Winnie-the-Pooh videos are for kids, you can actually pick up on some funny things as an older person that you wouldn't catch as a kid. =) But yes, the books are great too.